I found this album few years ago thru my interest to CURRENT 93 (David Tibet released it on Durtro). "Born in 1924, Sveinbjörn was a farmer and a poet at Svíndalu, and was to become head of the Ásatrú religion in Iceland, which honoured the old gods—the Æsir. He was the leading exponent of the chanted rímur style of reciting the Icelandic Eddas, and was a hugely important figure in the rebirth of what is often known in the West as Odinism. He died in 1993." 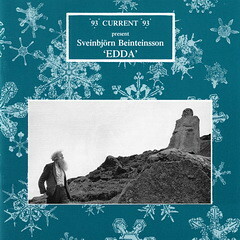 About: "The Poetic Edda is often considered the most interesting cultural contribution of the Nordic nations. The poems were originally recited from memory before an audience, but not written down until later. As written scripts from the poems were saved from falling into oblivion and made more accessible to a thorough study. The original method of transmitting them to an audience is however still valuable. The wisdom of these poems has not been rendered obsolete by the centuries that have passed, experience has proved its importance. The poems still warn against betrayal and cowardice, brutality and restlessness. The need to consult them is not any less now than before." "Archaic and haunting. To our ears unusual style; nothing to hear as "background" music." I've listened to it long time ago and it were very difficult for me to penetrate this work (and usually this is a good sign).